On Media Day, just prior to SHOT Show 2010, our Assistant Editor Jason Baney headed straight to the biggest, baddest rifles he could find — a pair of serious-looking tactical rigs from Barrett Rifles. First off was the mighty semi-auto Barrett 82A1, chambered in .416 Barrett. a “beast of a cartridge” according to Jason. The .416 is a very powerful chambering, and you can see the recoil pushed Jason pretty hard. That’s serious energy — Jason’s a big boy, and the Barrett 82A1 weighs nearly 31 pounds. Want one? You may have to liquidate some investments. MSRP on the Barrett 82A1 is a whopping $9345.00. Next up was Barrett’s bolt-action model 98B (“Ninety-Eight Bravo”), chambered in .338 Lapua Magnum. At less than half the weight of the Barrett 82A1, the 98B was much easier to steer on the bench and the ergonomics were generally better according to Jason. While recoil from the .338 Lapua Mag was stout, you can see in the video that the .338 LM kicked much less than the .416 Barrett, even in a gun with less than half the mass. The 98B gives you a good solid thump to the shoulder when firing. By contrast, the .416 Barrett in the 82A1 shakes your whole body. The 98B weighs 12.4-13.5 pounds (depending on configuration) and starts at $5039.99 without optics. Speaking of optics, the hooded display on top of the 98B is a Barrett Optical Ranging System (BORS). This $1500.00 gadget provides a digital read-out of your actual ballistics settings. It doesn’t control windage and elevation — that is still done manually with the scope knobs. BORS is an integrated electronic ballistic computer that mounts directly on the riflescope and couples to the elevation knob. Just turn the elevation knob until the LCD displays the target’s actual range (which must be pre-determined). The BORS’ three internal sensors automatically calculate a ballistic solution, compensating for up/down angle, temperature, and barometric pressure changes. It even tells you if the rifle is canted. It’s a handy device that eliminates the possibility that you loose track of your turret settings. 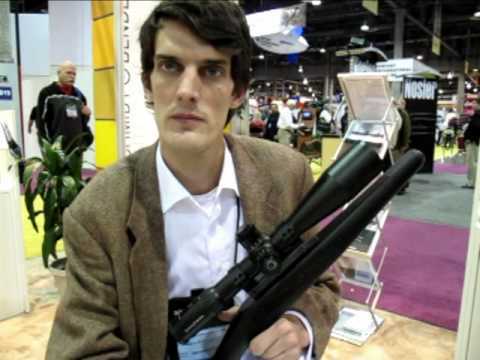 Share the post "SHOT Show Report: Baney Does Barrett — .338 Lapua Mag and .416 Barrett Tactical Rifles"
The IBS recently announced that it would allow AR-platform rifles to compete in local IBS benchrest matches in their own class. If you plan to campaign your AR in this new class, you should definitely add a 3″-wide front sled and some kind of rear bag-rider to your gun. Without a flat fore-arm “sled” and rear bag-rider, ARs tend to be very wobbly, and the standard rear stock (with sling loop in place) is terrible in a rear sandbag. 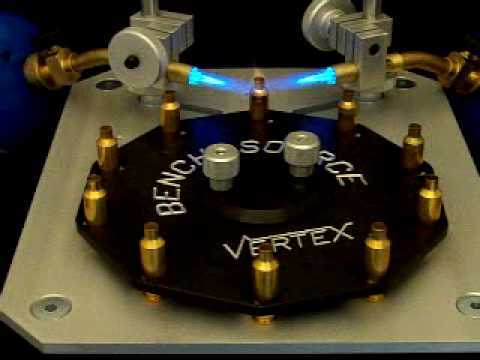 Robert Whitley’s AR-X Enterprises has just what you need to improve your AR’s bench behavior. AR-X sells precisely-fitted Delrin bag-riders, crafted expressly for ARs by Evolution Gun Works (EGW). The 3″-wide front bag rider (aka “sled”) features a “twin rail” design and attaches to a tubular fore-arm via a swivel stud. The rear bag-rider mates to the bottom of a standard AR stock and attaches via the rear sling swivel anchor. This provides a smooth, straight surface to ride the bags. These Delrin EGW bag-rider units were originally designed and prototyped for AccurateShooter.com’s 20 Practical AR project rifle. We tried many different designs, and the final production versions really work — as you can see in the video above. The AR bag-riders cost $40 front and $40 rear, or $75.00 for the set of two. To order, visit 6mmAR.com, or email Robert Whitley: rcw3 [at] erols.com . 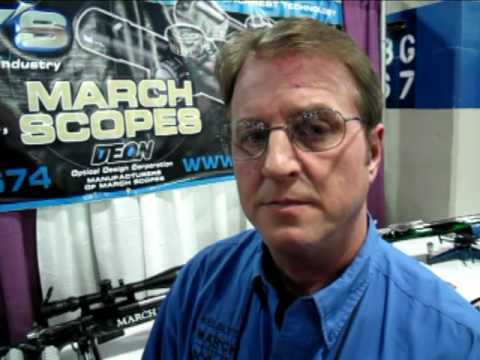 Share the post "Front and Rear Bag-Riders For the New AR Benchrest Game"
We had a chance to visit with Jim Kelbly of Kelbly’s Inc., at SHOT Show 2010. Jim had all the new March scopes on display, including the amazing 8-80x56mm long-range scope, part of March’s ground-breaking 10 times zoom range series. Jim reviewed the March line-up, explaining the many high-magnification models available for precision shooters. Jim also showed us the stainless Grizzly II action and the new Atlas series of stainless actions. The Atlas actions are designed for varminters, tactical shooters, and long-range shooters who want an affordable stainless action with a Remington 700 action footprint. The Atlas actions should be a simple drop-in installation for stocks inletted for Rem 700s. At the close of the interview, we asked Jim about the future of benchrest competition. Jim believes that we will see more cross-over of short-range shooters into the long-range disciplines (and vice-versa), along with growth in the F-Class and tactical disciplines. 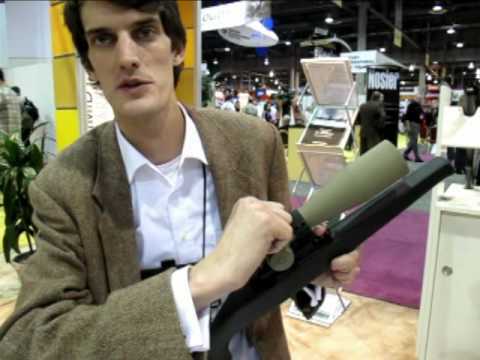 Share the post "SHOT Show Report: Kelbly's Offers New Products for 2010, including 80-power Zoom Scope"
Kent Sakamoto of RCBS showed us the new RCBS products for 2010. The big news for reloaders is an automated, .22-caliber bullet feeder for the RCBS Pro 2000 progressive press. This caliber-specific bullet feeder cycles 22-cal bullets directly into a modified seating die. Now you can load all kinds of 22-cal cartridges without even handling the bullets. The bullet feeder is a simple, bolt-on upgrade to the Pro 2000 press, and it can also be adapted to Hornady’s Lock-N-Load progressive, according to Sakamoto. The new bullet feeder utilizes the RCBS electric collator/hopper, which feeds the bullets from an elevated bin. The 22-cal bullet feeder will be available in March 2010, with a 30-cal version to be released later in the year. At Media Day, RCBS also showcased its long-awaited new AmmoMaster chronograph. Designed as an affordable, entry-level chrono, the new RCBS AmmoMaster is completely self-contained. All components, including cables and sky-screen, pack up into the central chrono “body” which is shaped like a giant cartridge case. The detachable control/display assembly (shaped like a bullet) can be positioned on your shooting bench for ease of access. The AmmoMaster chrono retails for about $125.00, making it one of the most affordable chronos on the market. It is available right now at leading vendors, including MidwayUSA (product #911572). Share the post "SHOT Show Report: New RCBS Bullet Feeder & Chronograph"
Defying its reputation as a stodgy, conservative organization, the IBS will allow AR-style rifles to compete in their own class at IBS benchrest matches next year. Both AR15-platform and AR10-platform rifles can compete in this new, provisional class. 1. This is an experiment for a one-year trial. 2. Clubs MAY have an AR class, but they are not required to do so. Share the post "IBS Approves Trial AR-Platform Benchrest Class"
We know many of our readers are interested in the new IMR 8208 XBR powder distributed by Hodgdon Powder Company. Early test lots of this new propellant have already won important benchrest matches, and field testing has shown that it is extremely stable across a wide temperature range. 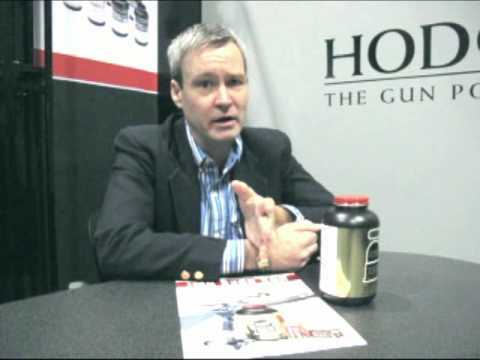 At SHOT Show 2010, we interviewed Chris Hodgdon, who gave us the “inside story” on this new powder. Before we started taping, Chris shared with us lab test results showing how pressure of a fixed load varied with ambient temperature. The data was stunning. Basically 8208 XBR showed almost constant pressures from below freezing to well over 100° F. This editor has personally never seen a powder test that revealed “flat-line” results like 8208 XBR, with recorded pressures remaining virtually unchanged over a huge temperature range. If the test results are to be believed, this is indeed a very exceptional powder. On some internet Forums, skeptics have suggested that IMR 8208 XBR is just an “odd lot of H322″, and that, accordingly, 8208 XBR may not be available for long. Chris told us that the skeptics are misinformed — those who have suggested that 8208 XBR is re-labeled H322 are completely wrong. IMR 8208 XBR IS something new and it IS here to stay. IMR 8208 XBR is NOT merely a “tweaked” blend of H322. Though 8208 XBR has small kernels like H322, allowing it to meter well, 8208 XBR is a completely new formulation. Moreover, IMR 8208 XBR is not going to be a “one-production-run” wonder. Chris explained that Hodgdon is fully committed to long-term production of this new powder. So if you acquire some now, and develop a great load, rest assured that you will be able to obtain more IMR 8208 XBR in the future. As Chris explains in the interview, Hodgdon is strongly committed to IMR 8208 XBR and Hodgdon plans to keep it in production for a long time. Share the post "SHOT Show Report: Chris Hodgdon Sets the Record Straight Regarding IMR 8208 XBR"
Savage Arms caused quite a stir at Media Day when it unveiled its new 110 BA big-bore tactical rifle. The 110 BA is initially available in two chamberings: 300 Win Mag, and .338 Lapua Magnum. The .338 version of this rifle is Savage’s first-ever .338 Lapua Magnum, and it is VERY affordable compared to .338 LM tactical rifles from other manufacturers. We predict this gun will be a big hit with shooters who want the long-range capability of the .338 Lapua Magnum cartridge but who don’t want to sell the farm to acquire a capable rifle. Once the initial demand settles down, you should be able to find a 110 BA for around $2000 (not including optics). NOTE: Jason removed his eye protection for this photo. We recommend that shooters ALWAYS wear ANSI-certified eye protection. The 110 BA gun comes complete with a detachable box magazine (DBM), target grip with base, a +20 MOA scope rail, and Picatinny accessory rails ahead of the action and on the side of the chassis. The stock has a comfortable cheekpiece that adjusts for height using a handy rotary knob. A similar knob controls the buttpad position, allowing you to “dial in” length of pull. 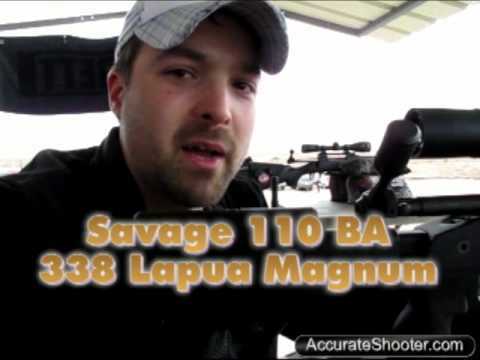 As you’d expect, the 110 BA features a Savage Accutrigger. On the gun we tested, the AccuTrigger broke clean and crisp under 2.5 pounds, with little overtravel. Fitted with an oversize bolt handle from the factory, the action was smooth in operation and effortlessly fed and extracted the big .338 LM cartridges. The gun demonstrated good accuracy with Hornady .338 Lapua Mag factory ammo, allowing Jason to make a first-round hit at about 800 yards. Jason liked the gun, telling us it “feels solid and well-balanced”. Jason did note that the large muzzle brake creates quite a side-blast. When this Editor was taking video, Jason warned me to get out of the way of the blast. I moved back behind the shooter, but even there, the brake’s blast could be felt. The 110 BA establishes a new, affordable price point for a true big-bore tactical rifle. Both the 300 Win Mag and the 338 Lapua Mag versions have an MSRP of just $2267.00. We expect to see the “street price” on these rifles peg below $2000.00. That makes the .338 LM version of the 110 BA one of the most affordable .338 Lapua magnum tactical rifles yet offered to the public. 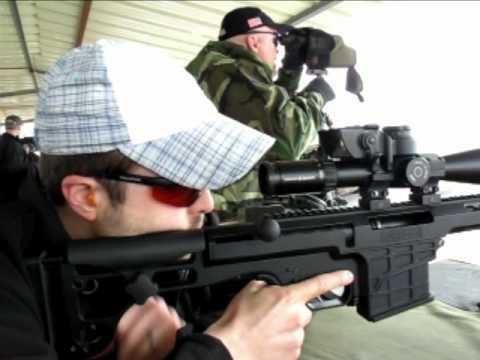 Share the post "SHOT Show Report: NEW Savage 110 BA Tactical Rifle in .338 Lapua Magnum"
The 2010 Winter Olympics are coming up soon, so we asked Uwe Anschütz to show us the Fortner-Action rimfire biathlon rifle that will be used by the vast majority of top competitors. This high-tech 22LR rifle features a straight-pull action that can be cycled nearly as quickly as a semiautomatic. The rifle is designed to be carried on the back while skiing, then quickly deployed at the shooting stages, where competitors engage banks of targets either prone or standing. Note the slots on the forearm for storing up to four extra 5-round magazines. In addition to the Biathlon Rifle, Uwe Anschütz showed us the model 9003 S2 Premium Air Rifle, which features a 9003 S2 action in the Precise aluminum stock. This state-of-the-art airgun earned medals at the 2008 Olympics in China, and it is a favorite of top compeitors worldwide. The model 9002 S2 features a very sophisticated buttstock assembly which with great adjustability. With this metal stock, you can adjust every point at which the rifle contacts the shooter’s body, from shoulder to cheek to hand. Even the angle and fore/aft position of the trigger shoe can be adjusted. 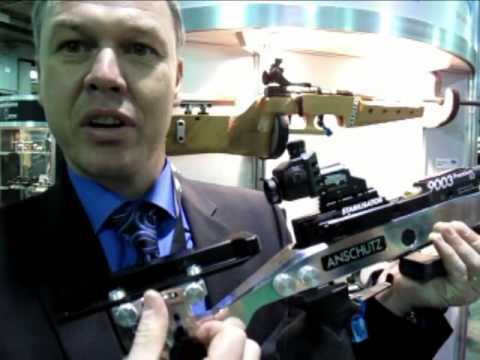 Share the post "SHOT Show Report: Anschütz Displays Olympic-Grade Smallbore and Air Rifles"
Share the post "SHOT Show Report: Freedom Arms Single-Shot Model 2008"
Though the use of high-tech materials, such as carbon fiber and kevlar, modern riflestocks have become stiffer, stronger, and lighter. Wild Dog, a small company in Queensland, Australia, is producing some of the nicest carbon-reinforced hunting and tactical stocks you can buy. Wild Dog stocks sport innovative features, such as a trap door for ammo storage in the side of the buttstock. Wild Dog’s hunting stocks are sized right and comfortable to hold — the comb height and drop angles are “just right” for a classic sporter. And when Wild Dog says they can build a stock that’s “ultra-light”, they aren’t kidding. Wild Dog’s Bruce Simms showed us a lightweight sporter stock that weighed just 20 ounces! We were sufficiently impressed that we may choose a Wild Dog stock for an ultra-light, walk-around varminter project AccurateShooter.com has in the works. 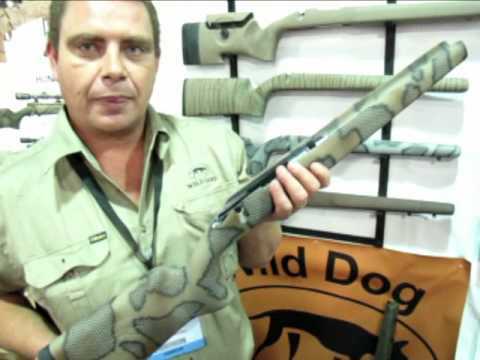 This Editor was also very impressed by Wild Dog’s tactical stocks. The Wild Dog thumbhole will work for shooters with any hand size. The grip section of some other thumbhole stocks (notably the Accuracy Int’l) is very thick and fat (way too fat for this Editor’s hands). By contrast, you’ll find the Wild Dog thumbhole is comfortable and controllable even for shooters with medium to small hands. Wild Dog’s adjustable cheekpiece system on the tactical stocks is better than most — the hardware is simple but sturdy and the cheekpiece fits flush when retracted. Overall, the Wild Dog stock designs — both hunting and tactical, are carefully crafted and very well thought out. The tactical stocks feel right in both offhand and prone positions. The hunting stocks are easy to handle and the hand-painted camo finishes really do work in the field, as you can see in the photo below. Share the post "SHOT Show Report: Australia's Wild Dog Carbon Riflestocks"
It’s big, it’s bright, and yes, it’s finally here in America. We’re talking about the Schmidt & Bender 12.5-50x56mm PM II/P scope, perhaps the most impressive long-range riflescope we saw at SHOT Show 2010. We first profiled this scope in April 2007, so it’s been a very long wait, but reasonable quantities of the big 12.5-50X PM II have finally reached American shores in reasonable quantities. The suggested retail price is a jaw-dropping $3199.00, but when you consider the whole package — clarity, sharpness, image contrast, color fidelity, click options, reticle options, ruggedness, and warranty policy — the S&B 12.5-50×56, has few, if any, rivals among ultra-high magnification scopes. This is a great scope, make no mistake about it, even if does cost as much as a custom-built rifle. Jason and I both agreed that, if there was one item we’d like to carry home from SHOT Show and mount on our rifles, it would be the S&B 12.5-50x56mm. This scope is as bright at 50X as other quality scopes at 40X. The 12.5-50x56mm is is available with 1/4 MOA clicks, 1/8 MOA clicks, or mil-based clicks, and with normal or double-turn turrets. NOTE: S&B also sells a 12.5-50×56 version optimized for 10m-70m Field Target shooting. It has a silver finish and “Big Wheel” side parallax control. CLICK HERE for Schmidt & Bender 12.5-50×56 Rifle Specifications. In addition to the 12.5-50x56mm long-range scope, Schmidt’s engineers showed us the popular 5-25x56mm PM II sporting a new “desert tan” ceramic coating. (CLICK HERE for large photo.) For 2010, this scope features new turret options that provide extra feedback and security for the shooter. First, either or both turrets can be locked in place by pushing down on the turret sleeve. Just pull up to unlock. Second, a pop-up cap confirms when the elevation knob is on the second revolution. That makes easier to use the scope at night. Finally, every 10th click of knob rotation is a heavy, tactile “clunk”. This does help track your revs and is especially useful with mil/cm-based turrets. S&B offers a wide selection of reticles, and you can choose between either first focal plane (FFP) or second focal plane (SFP) options. Share the post "SHOT Show Report: Schmidt & Bender 12.5-50x56mm Finally Available in USA"
At SHOT Show, Sightron rolled out its much-awaited 10-50x60mm, and it looks good. Currently available in either a Fine-Cross-Hair (FCH) reticle, or FCH with target dot, the new unit has 1/8 MOA clicks and 50 MOA of windage and elevation. Priced under $1000.00, this is a good value compared to other premium optics with similar max magnification. With a “street price” under $995.00, the Sightron 10-50 could become hugely popular in 600/1000-yard benchrest and F-Class shooting. The big new zoom features a jumbo 60mm objective, 30mm maintube, and 1/8 MOA clicks. Nearly 17″ long and weighing 28.9 ounces, make no mistake, this is a BIG piece of glass. If the new 10-50×60mm SIII Sightron is as good as the 8-32×50mm LR SIII we tested in 2009, this should be a fantastic scope for the money. Sightron had another much smaller, but equally impressive, scope on hand. It was the 10X model from the new SIII Tactical series which includes 16X and 20X versions also. The new SIII fixed-power Tactical Sightrons feature a modified mildot (MMD) reticle with 1/4 MOA clicks. These scopes (10X, 16X, and 20X) all boast an amazing 150 MOA of total elevation (and windage). We repeat: 150 MOA of total up/down travel. That allows you to shoot well past 1000 yards without needed an angled scope base. The parallax control is at the back, where you’d normally find a zoom ring. The position is actually very handy. With the parallax (focus) control near the rear eyepiece, you can easily set the parallax with your firing hand without moving out of position. These new fixed-power Tactical Scopes will retail for about $550.00. 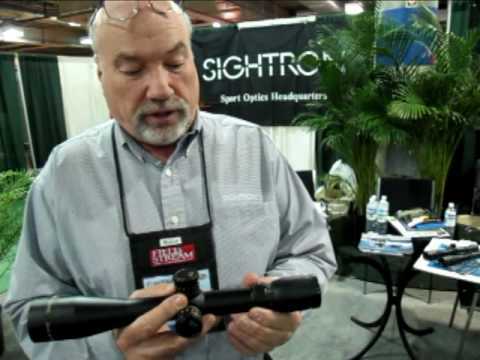 Share the post "SHOT Show Report: Sightron's New 10-50x60mm and Rear-Parallax Fixed-Power Tacticals"
Lapua arguably has the best line of match-grade cartridge brass you can buy in the USA. And now Lapua has made its brass even better. Starting this month, when you purchase 100 pieces of Lapua brass, your cases will arrive in a handsome blue plastic box. Snapped in place under the box lid is a rectangular plastic grid that fits in the bottom of the box. Pop the grid loose and slide it into the box. Side supports molded into the lower section hold the grid in place. Voila, instant Ammo Box! Each grid contains holes for fifty (50) loaded rounds or empty cases. The convertible plastic container/ammo box is a great idea that Lapua executed very nicely. Now you have even more motivation to purchase your cartridge brass from Lapua. Brass delivered in the blue convertible blue plastic boxes has already started to arrive. We confirmed with Powder Valley that its most recent shipments of Lapua brass have arrived in the blue plastic boxes. Note, however, that pre-existing inventories of Lapua brass, from Powder Valley and other vendors, will continue to ship in cardboard boxes until the older supplies are exhausted. Share the post "SHOT Show Report: New Lapua Brass Containers Transform into 50-Round Ammo Boxes"
Now that Zephyr Dynamics’ “Brass-O-Matic” rotary case annealer is no longer in production (Zephyr Dy’s owner received a “job offer he couldn’t refuse”), we were excited to learn that Bench-Source is bringing out an all-new, micro-processor-controlled, automated annealing machine. Bench-Source, based in Mississippi, currently produces high-quality scope bases for Savage target actions. The annealing machine is a new direction for Bench-Source, but it displays the company’s trademark attention to detail and superb machining. The new Bench-Source automatic case neck annealing machine processes 500-600 cartridges per hour, from 22 Hornet up to the big magnums. Heating time from 1.5 to 10 seconds is precisely controlled by a microprocessor with both a manual mode and “Automatic” mode. Note that the cartridge spins in place when it is at the annealing position, giving a uniform anneal. After annealing, the case exits via a gravity-fed drop port, so you don’t have to handle hot cases. Note: In the video below, the flame you see on some cases is burn-off of temp-indicating marker. Watch carefully and you can see that the case being annealed spins while being heated. You can use either one or two heat sources. Torch tips are adjustable in height, angle, distance and vertical tilt by two clamp knobs. Unlike some other units, the flame height is quickly and easily adjustable. We were pleased to see all the top surfaces are metal (no plastic to warp or melt). The solid aluminum table top and index plate are also cooled by a 50-cubic-feet-per-minute fan — they will not heat up significantly during use. Additionally, the table acts as a heat sink to maintain hardness in the cartridge case head. The unit goes on sale in March 2010. Anticipated retail price is $449.50. To order, visit Bench-Source.com, or contact Vertex Mfg. at (662) 895-0803. Share the post "SHOT Show Report: New Bench-Source Case Neck Annealer"
For decades rimfire shooters have used muzzle weights and various types of tuners to optimize barrel harmonics. 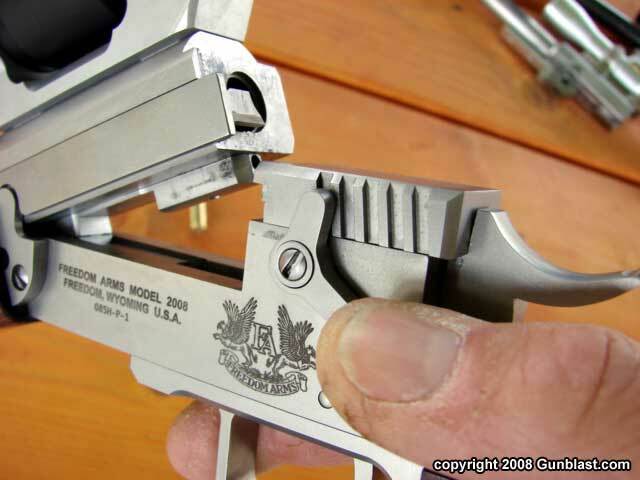 Just in the last few years have tuners started to appear on centerfire bench guns. And for centerfire rifles, partly by reason of benchrest rules, most of the tuning systems are fairly heavy metal cylinders placed at the end of the muzzle. It is well-established that mid-barrel tuners can work on rimfire rifles, and we also know that certain types of materials (such as rubber, cork, and Delrin) can have beneficial damping effects on both rimfire and centerfire barrels. Given these facts, we were quite interested in the new Flexi-Weight System introduced by AirForce Airguns at the 2010 SHOT Show. The Flexi-Weight system consists of a cluster of 3 to 6 metal weights, held in place by a rubber O-ring. Multiple Flexi-Weight clusters can be installed on a single gun and the fore-to-aft position is easily adjusted. The shooter can simply slide a Flexi-Weight cluster back and forth along the barrel until he finds the optimal position. We have no idea whether Flexi-Weights can improve accuracy on a centerfire rifle, but it’s worth a try. Flexi-weights are affordable ($29.95 for a set of five, 48 gram weights) and you can slip them on your barrel without cutting threads or making any other permanent modifications. The weights are designed to fit a 1.25″ diameter tube. For more info, visit Airforceairguns.com or call (877) 247-4867. Airforce Airguns is a U.S. company based in Fort Worth, Texas. 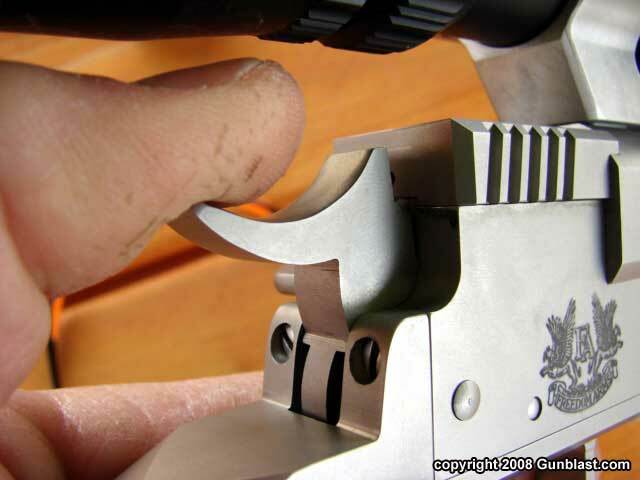 Share the post "SHOT Show Report: Adjustable barrel weights from AirForce"
If you recently purchased a Remington 40X rimfire rifle from the CMP, and the bolt is old, worn out, or missing altogether, take heart, Dave Kiff of Pacfic Tool & Gauge (PTG) has a solution. For a $199.00 “locked-in price” for AccurateShooter.com readers, PT&G offers a complete Remington 40X replacement bolt for CMP Rem 40X rifles. Even if your original factory 40X bolt functions, the replacement bolt should fit better (with less slop) and provide more consistent ignition, shot after shot. We won’t promise improved accuracy, but we predict that you get fewer unexplained flyers with the Kiff replacement bolt. Below, the charming Ashley Kiff explains the $199.00 special offer for our readers. 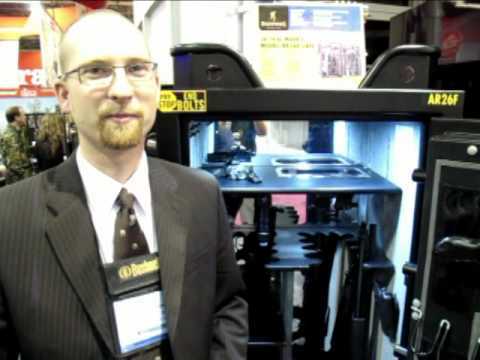 Share the post "SHOT Show Report: PT&G Rem 40X Replacement Bolts"
Among the many brands of gunsafes on display at SHOT Show 2010, two series of safes caught our attention. Browning’s new Tactical MK II safes possess many smart features, such as rubber-coated shelves and built-in LED lighting, that we’d like to see as ‘standard equipment’ on other safes. The Browning Tactical safes even offer handy Picatinny rail sections on the bottom of the upper shelves, so you can securely stow optics or rail-mounted accessories when not in use. Check out the video below, which showcases the unique features of the 60″x30″ Browning Tactical MKII safe. Pendleton drew crowds with its innovative line-up of cylindrical safes. A Pendleton Safe looks like a large vertical water heater clad in heavy steel. Pendletons feature a fairly narrow front door with a multi-level, rotating gun storage carousel inside. The big advantage of the Pendleton safes is that they are very, very resistent to pry-bar attacks. The door gap is just .090″ (ninety thousandths) making it very hard to insert a prybar. The safe’s curved sides offer no entry points for prybars, and if a thief manages to tilt the safe over, it just rolls when leverage is applied to a prybar. The doors feature a patented cam locking mechanism and a commercial grade blocking plate to prevent drill attacks. Notable were the number of locking “bolts” — actually rectangular locking tabs of solid 1/4″ steel, providing 54 square inches of locking surface (compared to 4-8 sq. inches on bargain Costco/Walmart safes). Where some cheaper safes may have only three locking bolts on one side of the entry door, the 72″ Pendleton has 14 locking “tabs”, arrayed on the left AND right door sides (seven per side). A very impressive new safe, the Pendleton offers exclusive, patented security features, along with quality fabrication by a well-known, US-based commercial safe manufacturer. 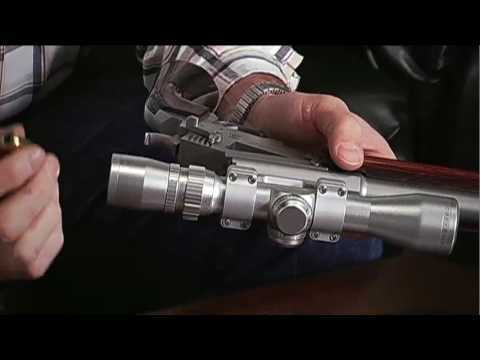 Share the post "SHOT Show Report: Innovative GunSafes from Browning and Pendleton"